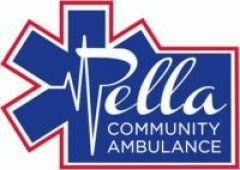 Pella Community Ambulance is a non-profit organization that has been proudly serving Marion County for 34 years. Consisting of a mix of paid and volunteer staff, the ambulance service provides 24/7 coverage to Pella and its surrounding communities. The board of directors has prioritized community education as an essential function of the ambulance service. PCA’s instructors have hundreds of hours of community instruction, and CPR classes are a large part of that outreach. The service utilizes three ambulances and one rescue truck. Pella Ambulance is unique in that the service is one of the only non-fire services to carry extrication equipment such as the Jaws of Life. Ambulances are purchased every few years to keep the fleet in prime condition. For wilderness rescues, the service also has a rescue Gator. During Tulip Time in May, EMTs ride around town on first-aid equipped bicycles and the Gator to provide rapid response to medical emergencies.